Most households have at least one plunger, and most people assume they know how to use it properly. In fact, there are two basic types of plungers--one being more effective than the other at clearing toilet clogs. 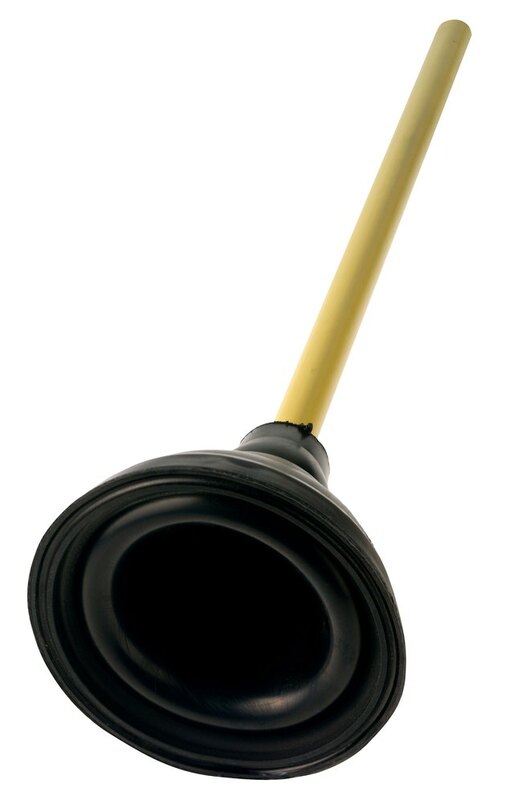 The proper technique for using a plunger may mean the difference between clearing the clog yourself or having to call in a plumber. For best results, use a flange plunger that has a rubber extension for toilets. For sinks and tubs, use a standard cup plunger. Cup plungers are best for sinks and tubs, not toilets. Turn off the water supply to the toilet at the valve that's usually located behind the toilet. Turn the valve completely clockwise to close. Protect the floor surrounding the toilet with newspapers or towels. Put on rubber gloves. If drain cleaner has been poured down the toilet, don eye protection. Place the plunger into the toilet so it completely covers the drain opening. The bowl needs enough water to reach at least halfway up the head of the plunger. You may need to add water with a bucket. Grip the handle of the plunger with both hands. Push it down slowly, but bring it up quickly without lifting the head of the plunger from the drain. The plunger should be perpendicular to the drain so it can be pumped straight up and down, rather than at an angle. Pump the handle up and down rapidly several times to create suction and dislodge the clog. Release the head of the plunger after pulling up sharply several times. Flush the toilet to see if the water flows freely. Repeat the pumping and releasing action several times. If the clog remains, use an auger to clear it or contact a plumber. Cover the overflow outlet by placing a wet cloth into the opening. Submerge the head of the cup plunger into the standing water. Add sufficient water to cover the head of the plunger, if necessary. Hold the plunger with both hands and push down forcefully. Pump the plunger up and down with equal force for about 10 seconds without breaking the seal between the plunger head and the drain. Release the plunger head from the drain to see if the water drains out. If not, repeat step 3 several times. Consult a plumber if the sink remains clogged.